An anthropologist might analyze your family background by ingredients in your turkey stuffing. 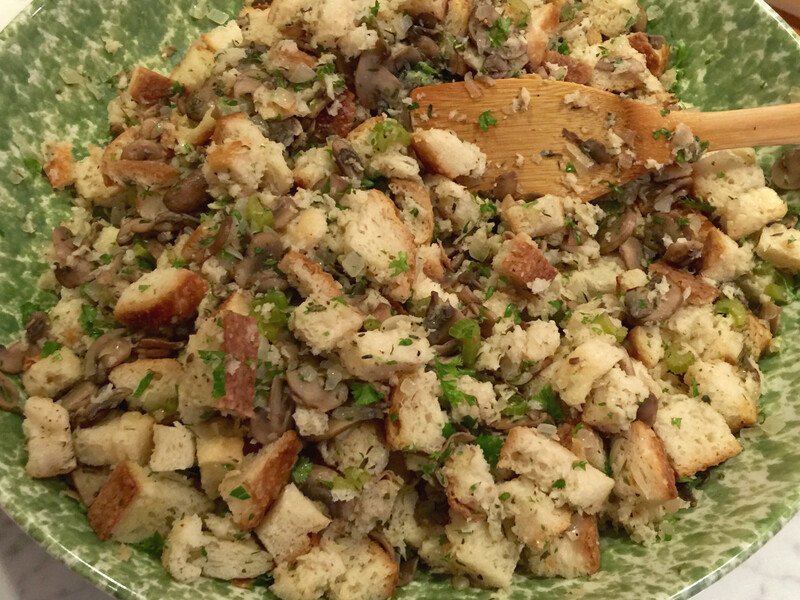 I wonder what could be said about my stuffing — a simple mix of mushrooms, onions and celery? No eggs. No butter. Probably some joke about mushrooms. However, a variation of this stuffing has graced my Thanksgiving table since 1980 when I first published the basic recipe. Even subtracting the ten or so years I spent as a restaurant critic eating out on holidays, its deliciousness has spanned a generation. Based on the method I learned in France for inserting a vegetable mixture between the breast and skin of a chicken, I have always used this stuffing between the turkey breast and skin to protect the delicate white meat during roasting. The result has been extra-moist turkey every time. So the quantity — for a 12 to 15 pound turkey — is enough to cover each side of the breast and fill the cavity and the neck skin, too. Alternately, it can be dotted with a little butter and baked separately in a 3-quart heatproof dish until just hot all the way through. The stuffing also has lightened up a lot over the years. I originally made it with leftover mushroom-flavored bread. At one point it included cooked pork breakfast sausage which was delicious but heavy. After I moved from Chicago to New York, I could get fabulous sourdough a few blocks from my house and sourdough it’s been ever since. 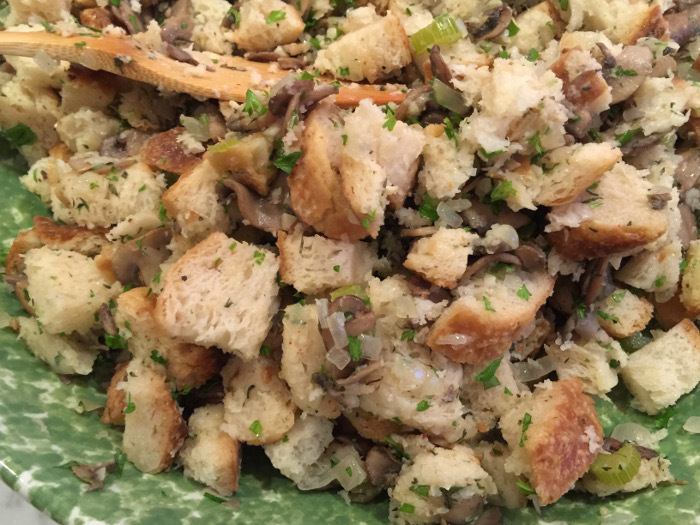 I love the texture and flavor sourdough and truly believe it makes all the difference in the stuffing. Most recently, I replaced butter I would add for its “basting”quality with olive oil. So now it’s down to 7 basic ingredients — sourdough, chicken broth or water, oil, garlic, onions, celery and mushrooms plus parsley, herbs and seasoning. The sourdough absorbs a full two cups of boiling hot chicken broth or water. Then the vegetables are cooked until they are softened and stirred into the bread cubes along with herbs that help make turkey even more delicious. Put the bread cubes in a large mixing bowl. Pour the hot chicken broth evenly over the bread cubes; set aside to cool. Heat 3 tablespoons of the oil in a large (10 to 12-inch) skillet. Add garlic and onions. Stir over low heat until softened. 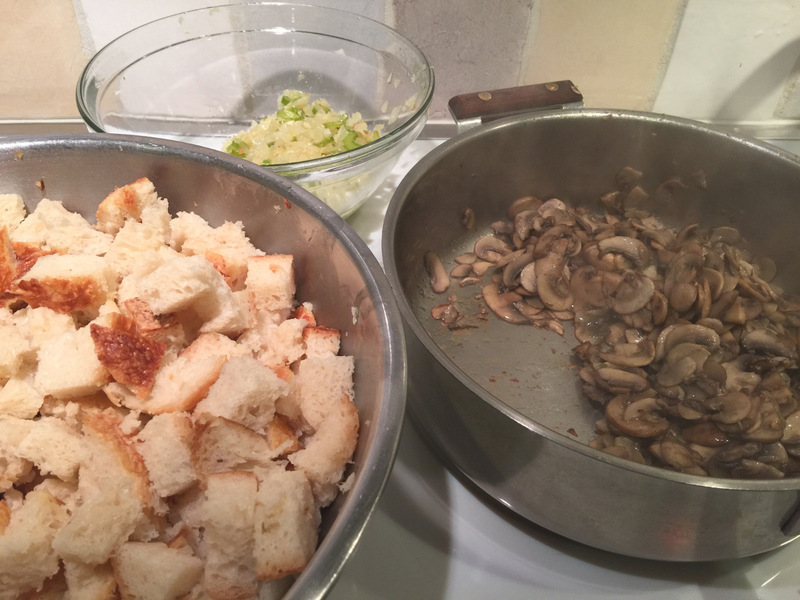 Stir in celery and cook over medium-low heat until celery softens; add to the bowl with the bread. Heat remaining 3 tablespoons oil in the skillet. Add all the mushrooms and toss over medium-high heat until they darken and give up their juices. Continue cooking over medium heat until all the juices have evaporated and mushrooms are sautéed. Add mushrooms to the bowl. Add salt, pepper, thyme and savory; mix thoroughly. Adjust seasoning to taste and stir in parsley. Can transfer to an airtight container, cool, cover tightly and refrigerate up to 3 days. Remove from refrigerator 3 to 6 hours before using. Quantity - The recipe makes about 10 cups of stuffing — enough for cavity and both sides of the breast of a 12 to 15 pound turkey. The recipe doubles and triples easily and a variety of mushrooms can be used (see notes below). Adding sausage - 1 pound of bulk breakfast-style pork sausage can be thoroughly cooked, drained, crumbled and added to the stuffing. Since sausage is highly seasoned, it’ a good idea to omit all seasoning from the recipe until after the sausage is mixed in. Taste it hot and adjust salt and pepper. Breakfast sausage is delicious in this recipe but makes the stuffing much heavier and may also affect seasoning pan juices. How far ahead? - I have made this stuffing as long as 3 days in advance and kept it refrigerated in an airtight container. Using sourdough bread prevents the stuffing from becoming mushy and using oil to cook the vegetables helps keep it moist. Because the it contains no dairy, it remains fresh and moist. If necessary to make it farther ahead, use boiling water to moisten the bread (there are additional notes on that under Switch Ups below). Chicken Broth - If stuffing must be made more than 3 days in advance, substitute hot boiling water for the chicken broth. This is also a solution for vegan stuffing baked separately. 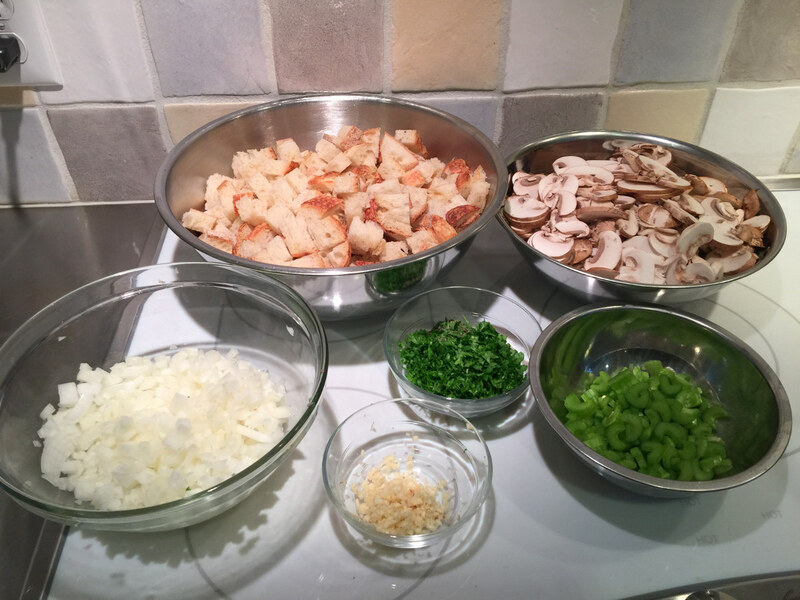 Mushrooms - I use a combination of fresh white and fresh cremini mushrooms. I’ve used portabello mushrooms in the past but the caps exude a very dark liquid when they are cooked which can make the stuffing look quite dark. They are delicious. Porcini Mushroom Bouillon Cube - Many Italian and gourmet stores import porcini mushroom bouillon cubes from Italy, where I first discovered them. I always keep a supply on hand. 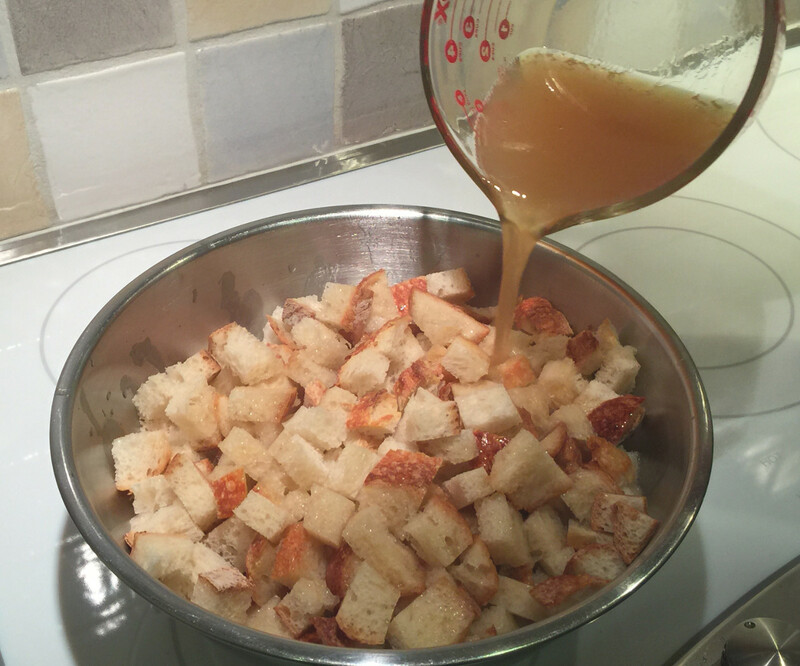 If I don’t use chicken broth for the stuffing, I dissolve 1 porcini cube in the boiling water and use that to moisten bread. These bouillon cubes are very salty; use them sparingly. Bread - White or whole wheat sourdough can be used. It can be day old or kept well wrapped in the freezer and defrosted before use. I use a sourdough boule. If sourdough isn’t available used day-old crusty French or Italian bread — do not use soft supermarket style breads or stuffing will be mushy. If necessary to make your own bread in advance of the stuffing, I recommend the no-knead Sullivan Street Bakery bread which appeared in the New York Times. Being a non-traditionalist, I do not not do turkey for TGV, now that there is not a group of people to feed. Also, I don’t care for turkey. However, this stuffing looks delicious, and I am going to try it with pork roast, cooked on the side. I had no idea you had been a restaurant critic! I had noticed all the wonderful posts lately, and it seems you are a certified foodie! I look forward to more.